We'll be drinking it this evening, but I did sneak a little taste. Not too shabby. I look forward to enjoying it with suitable dairy accompaniments. 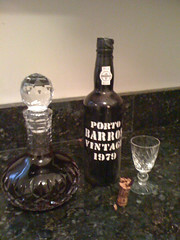 Now that looks like a very fine idea, and a very fine bottle of port. Had it have been shared more widely perhaps my hangover would have been lessened. Ow.